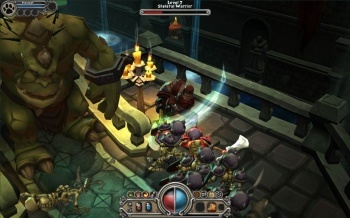 Runic Games CEO, Max Schaefer, blames protracted development periods and inflated budgets for a perceived lack of innovation in the industry. When asked about the state of the industry in 2012 during an interview with Gaming Nexus, Schaefer responded that although 2011 saw the release of some fantastic games, there's still room for improvement. "We could still improve as an industry in pushing innovation more than $200 million projects," he said. "We stifle ourselves and our customers with over-produced, 5-year development, derivative games." It does seem a bit rich for Schaefer to criticize "derivative" games, given that Runic Games' only game thus far has been Torchlight, a game that could be described, if you were feeling spiteful, as Diablo 2 with a pet dog. Schaefer did add that he Runic will develop new IPs in the future, but he wants his team to work on projects one at a time. "Runic has an independent spirit, a love for game-making, a respect for our customers, and a fierce desire to stay small, nimble, and responsive," he said. "We're not trying to be the next EA, or the next Blizzard. We don't want an empire. We just want to carve out a niche where we can provide great games with incredible value." He also had some harsh words for the traditional retail model. "I'll get in trouble for this, but I look forward to the end of boxes and disks," he said. "Kill them with fire for all I care. The retail market has historically starved developers and narrowed the market for available games."